Unique and distinctive jewelry tags with your custom-designed logo. Create your unique jewelry with your own logo. You can order 300, 500, or 1,000 pieces to individualize your jewelry with your name or your logo. You decide whether you want your name, an individualized message, or your logo. You can design your own tag or you can choose from available standards. If you design your own tag, all we need is a drawing or a picture. 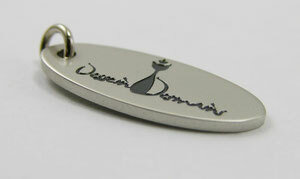 The jewelry tags are individually manufactured and shipped with a jump ring attached to each tag. With our jewelry tags, your work will be easily recognized, and you will gain new customers. You don’t have a logo yet? Choose from our existing collection, or tell us what you envision. For information on individualizing our existing collection, click here.